Choose Height: Required 10" 12" 14"
These T-style handlebars are a clean look on FXR's, Dynas, Sportsters, and Choppers. Made from rugged seamless 4130 chromoly construction for strength, comfortable ergonomics for high-performance riding and clean aesthetics for modern club bike style. 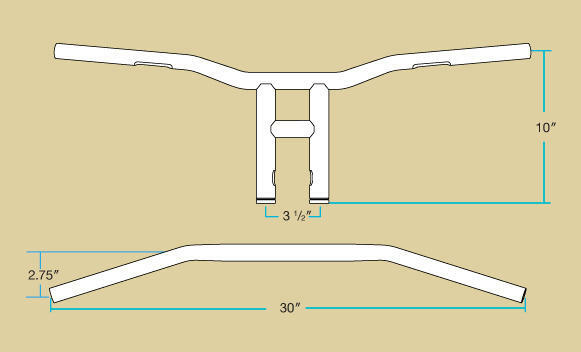 The handlebar is 0.120" wall (3mm) seamless 4130 chromoly, and tapered from 1-1/8-inch at the center to 1 inch O.D. on the ends. CNC-machined slots in both bar ends to facilitate easy wire routing on stock and select aftermarket hand controls. Tyson XL's vertical uprights are 1-1/4-inch O.D. x 0.120" wall seamless 4130 chromoly tubes precision mitered and TIG welded to the handlebar for beauty and strength. Tyson XL uprights uprights are on 3.5-inch wide centers to fit most stock and select aftermarket H-D top trees. They feature TIG-welded internal mounting bungs that accept the 1/2-13 t.p.i. mounting bolts on the motorcycle. Please consult a qualified Harley-Davidson or custom Big Twin mechanic if you are not sure about fitment on your specific motorcycle. Biltwell Keystone XL Handlebars - 1"